The Road to becoming a Solo Filmmaker. It's been a journey of a ride for Leeds based filmmaker and director Edmahoo. It hasn't been easy, but perseverance, hard work and determination has got him to this stage where he is now. The term 'Solo Filmmaker' literally means what it says, Ed has solely taken on his project single handed. From making cups of tea for the actors to the final stages of filming, he has done it all. He explains, "I can be very spontaneous, there is a lot of ideas floating around in my head and I tend to jump from one role to the next, and without explaining myself I expect others to understand what I mean. It can sometimes sound very confusing, but I have since learnt to break down my ideas into stages... I think this is because, the story is all in my head and I know the ins and outs. The actors only know what they're supposed to know for that particular scene." Man of Many Talents, Master of Non. Film making truly is an art in itself, there are just so many things to learn and understand. 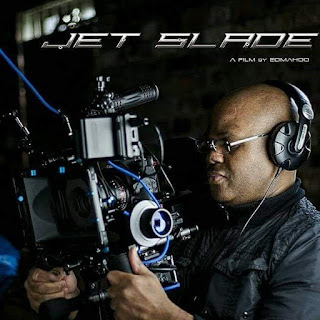 With many talents under his belt that he has acquired over the years, they have really come into play with the making of his Indie feature Jet Slade: Rise of the Black Hood. He is always willing to learn, he never stops and just keeps on trying to perfect his skill. It's like anything you practise, it soon becomes second nature and part of you. Jet Slade: Rise of the Black Hood. 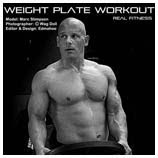 Currently in post production, Ed has spent a weekend putting this exclusive Promo together. Featuring most of the cast in the movie, he is very proud of the hard work they have put in to get this project off the ground. With last minute film re-shoots and getting the cast in for ADR, the film is really starting to take shape. Like any action movie Ed is big on sound, he just loves going to the cinema to experience the awesome sound production and work they put into making a film come alive. In this respect he has spent a lot of time on the sound for Jet Slade by presenting it in Dolby Digital 5.1 AC-3 Surround Sound. He just loves sound placement and the process of how it all works and enhances the viewing pleasure of a film. Unfortunately some social media platforms like YouTube, Facebook and Twitter do not support AC-3 surround sound and will recode it to a stereo format. But you can always make your file a Zip file and send it to clients etc. Jet Slade: Rise of the Black Hood - EXCLUSIVE Promo. Starring: Bridget Mae, Humphrey Casely-Hayford, Ewa Magdalena, Rochelle Goldman and Stephen Johnson. 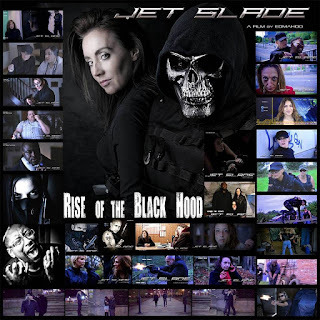 We hope you've enjoyed reading this short blog post and watching this new Promo for Jet Slade: Rise of the Black Hood. Feel free to share this post, we appreciate your support.